This creation experience was filled with learning and self correction opportunities. I made a total of 4 string chandeliers. The first 2 did not turn out correct. The paste the I used was too thick and cause the string to loose shape of the balloon it was attached to. I originally got this idea to create a chandelier due to the small obsession I have for them. I always enjoy looking at them and following the intricate lines and shapes within. I then did some research and found some people who made some out of string for fancy occasions such as weddings and parties. I developed new art skills by using new techniques such as the use of a paste of wrap and stick the string to the balloon. I was able eventually produce a desired product even though I had to stray away from my original plan. This mini project was a great practice with 3-D art and working on solving problems on the spot. 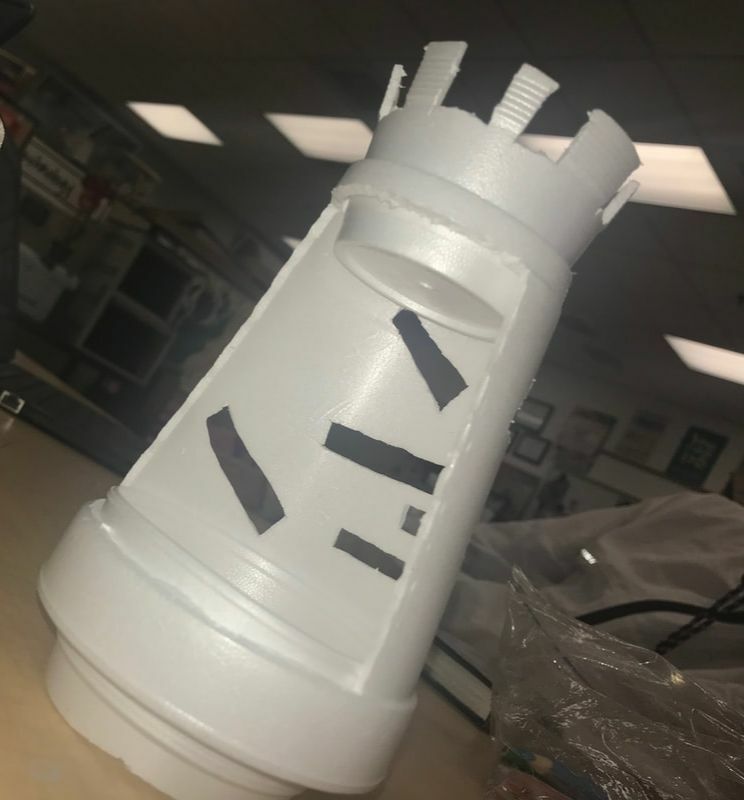 Throughout the making of this piece I encountered a lot of issues with design and making slight mistakes, but I was able to work through them, change some things and create an artwork using the styrofoam. I also was able to try new techniques working with the styrofoam. Learning how to cut it and mod it to fit my vision. I started with two of the cups, and I used knives and scissors to transform the two cups into one whole. In this art project, I collaborated with my art classmates, Shekinah and Ercilia, to recreate my very first abstract art piece from the beginning of the semester. We all worked together to choose a section from the composition, and figured out how to change the black and white composition practice into a colorful masterpiece. Along the way we received feedback from our first period art peers to find ways to enhance and solve issues that arose. Throughout the duration of the project, my group and I had many conflicts. One being choosing color schemes and trying to fix mistakes made with the paint on the canvas. When we first started, we had issues matching shades with our plan as well as creating textures that made sense. 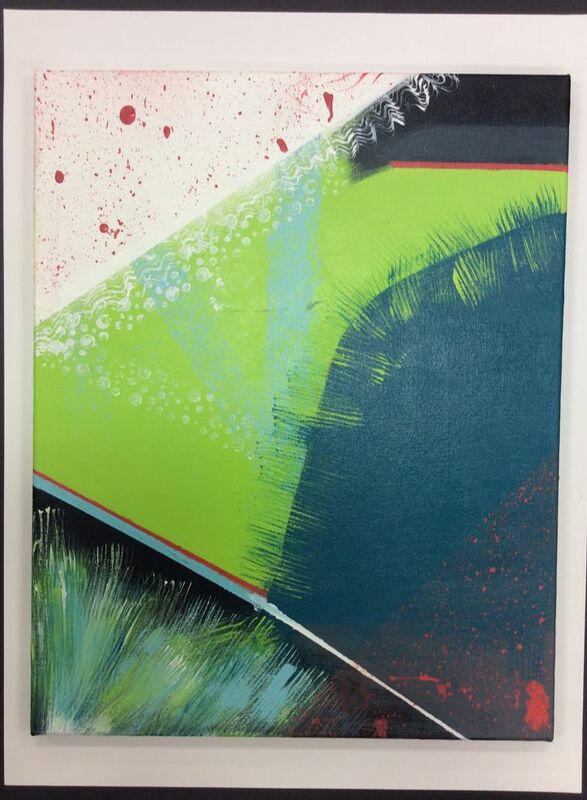 We struggled with the concept of experimentation and focused too much on making the piece look a certain way. After finding way to solve these several conflicts and accepting the essence of abstract, we were able to take risks and fill the canvas with amazing ideas. These risks included trying new techniques, playing around with paints and colors, adding to, and even taking away from the composition. In the end we made a piece that reflected the hard work and diversity of our group, ideas, and personalities. "Perception" is all about what the names says. How the view perceives all the information in front of them. This slideshow demonstrates the progress of learning the composition of photography. In the first photos of each set (labeled 1), I took pictures with my phone with little to no knowledge of the rules and guidelines associated with photography. In the first landscape photo, I just walked outside and took a picture without thinking too much about it. The same goes with the architecture and still life photos. I just snapped the picture and moved on. After a brief lesson with Mrs. Schuman, I learned some general guidelines to help enhance these first pictures. I took the lesson and either cropped them to fit the rule of thirds rule, brung my horizon below center, or created balance and symmetry to help make these pictures more visually pleasing. 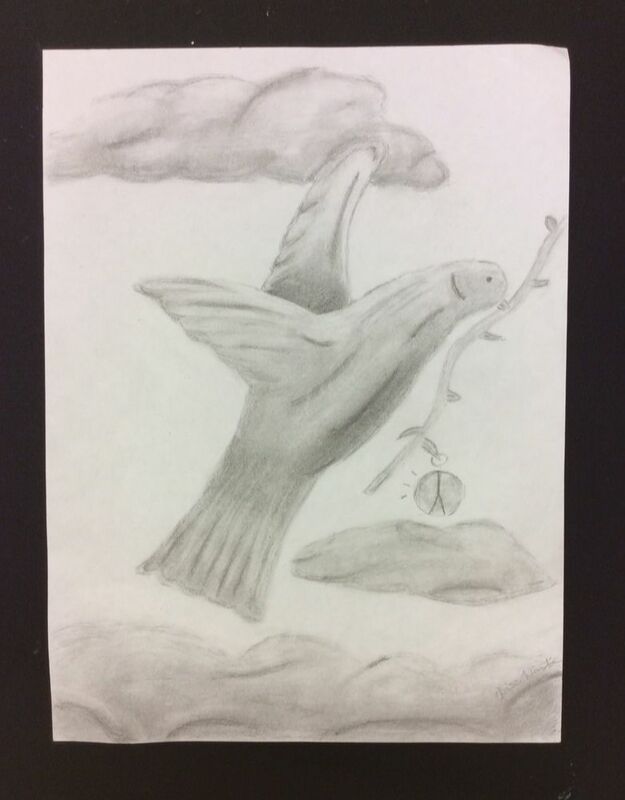 “Calming Peace” is an artwork created based around a dove bringing peace through the sky. I decided to create this peace with strictly graphite to help really focus on every aspect of the piece as one uniformed body. I was able to really practice using different values and begin to teach my mind to process moving color into these blacks, whites and grays. The word “naturescape” raced my mind into many different images, but all these images reminded me of how calming and grounding nature can be. I took inspiration especially from a lot of social and political current events, and the idea of a well known symbol delivering peace to a world that can be chaotic was personally calming for me. Through this piece I grew a new love and form of respect for the graphite media, that I will be able to express in future artwork. Inkspalts: "Bringing Nothing to Life"
I named this art piece “Bringing Nothing to Life” due to the actual work that was put in to create it. The jellyfish (subject matter) started out as a plain white paper, then was made into a weird looking blob of ink, which then formed into a beautiful organism in the middle of it's habitat. 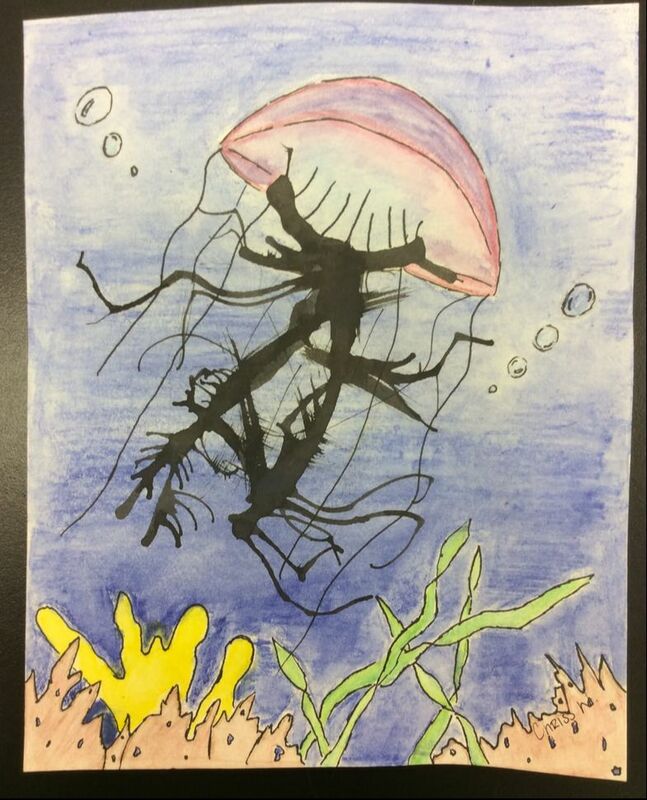 Inspiration mainly came from the input of my peers and the layers of color present in the jellyfish’s structure. I was able to achieve brining something that may have been considered weird or impossible into a beautiful work of art. A VMCCA and Wake Tech, Nurse Aid student. Chriss has a passion for music and dance. She is very excited to further an education in Nursing past high school.